You can get a Sourdough Starter happening well enough to make bread in 7 days. The trick is feeding the fresh starter the right amount of flour and water at the right time. The measurements start small, but grow quickly. This is because sourdough starter is a living thing, and as it grows, so too does its appetite. You'll be doubling the size of the sourdough starter every couple of days, so make allowances for this with your storage container. I use a clear plastic container, about 1 to 1.5 litres, with a clip on or loose fitting lid. If it's 'clip on' type, leave it loose at all times when storing sourdough starter, so it can breathe. The young starter will take about a week to consume it's own volume of air. Following is the rapid version of the recipe - further down want to underneath is the explanation, for when you get into the detail. In your container, mix one tablespoon of wholegrain flour to one tablespoon of unsweetened pineapple juice. During cold weather, allow the mixture to rest one more day before proceeding to the next step. 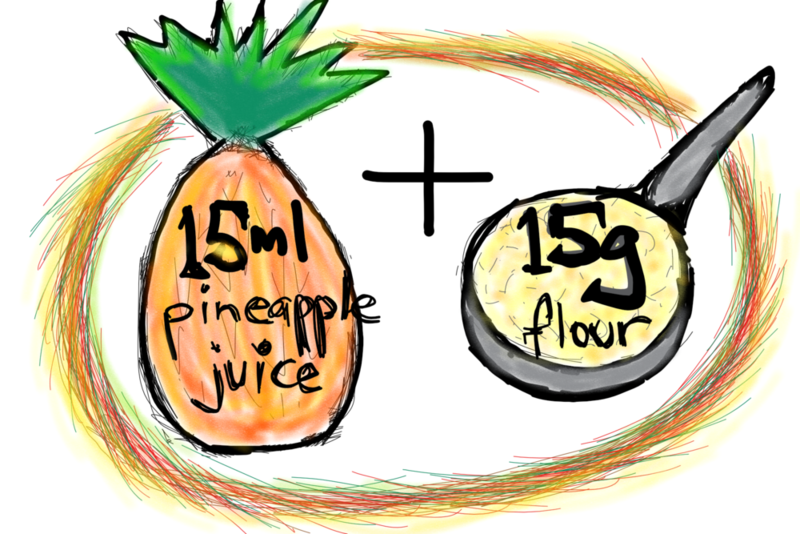 Add two tablespoons of wholegrain flour and two of pineapple juice and stir them into the mixture. Add two more tablespoons of wholegrain flour and two of pineapple juice. Stir into the mixture. Add four spoons of wholegrain flour and four tablespoons of pineapple juice and stir in to the mixture. Allow to rest until bubbly (possibly another day or two. Your starter is now built. Begin using your starter when it’s bubbled up and then sunk down. For your first dough, just use a small amount (say 100g) of your young starter in a formulation (use the semi leaven technique discussed below) and then return double that amount to the brew. So if you used 100g, return 200g. This amount is made up of 100ml water, and 100g flour. You’ll note that we no longer are using pineapple juice to feed the starter. It’s just water from now on. Over a few uses and feeds, you should be able to bring the starter up to a total of about 600g. During this first part of your starter’s life - lets call it your starter’s birth stage - it’s best kept out of the fridge. Room temperature helps the starter ferment. Once it is built, most people then keep it in the fridge. Bring it out for feeding, using and rapid ripening (if necessary). Please Note: For the first six weeks of your starter’s life, use ‘semi leaven’, 'or’ hybrid’ formulations to make bread. This type of formulation has a small amount of yeast added to the dough to help it along. I like to think of these first six weeks as the ‘toddler’ phase. Pure sourdough formulations at this time will be very inconsistent, or consistently heavy during this time. Toddlers do fall over a lot. When your starter is six weeks old, let’s say when it enters its ‘school years’, it can be used in pure sourdough recipes. Your starter will have established a viable culture of bacteria, wild yeasts and enzymes by this time. Effectively, your starter can walk and chew gum at the same time by now. The more mature the starter becomes, the better the structure and taste of your bread. The starter grows a body, if you like, and when it does so, the bread grows a body too. Semi leaven or hybrid sourdough recipes require a small amount of yeast (about 1/2 to 1 % of powdered yeast against the flour weight) to help with the rise. The more established your starter becomes, the less yeast you will need. Eventually, you won't need yeast at all. Ripening times in the dough will slow down; you’ll be working at sourdough pace now. When using yeast, it is important not to contaminate the starter. Keep the lid on the starter while making dough with yeast. Never put yeast in the starter itself. You can buy yeast anywhere, but your starter becomes you; the older it is, the better. Sourdough starter is a living thing. Inside that bubbling jar of goodness is a rather complex and beautiful process which won't be hurried. In the same way that a child grows every day, but still takes about thirteen years to achieve physical maturity, sourdough starter needs about six weeks before it is viable. During that time, a lot of important things happen. A number of different yeasts will have entered through the grain and in the air, and they will be slugging it out among themselves to establish supremacy under the specific conditions the starter has. At the same time, there is a bacteriological process taking place where a flow of bacteria is being created. Over time, a very specific enzyme environment evolves from all this activity, which effectively ‘fine tunes’ the newly created organism to do the best possible within the environment. This environment is constantly making micro adjustments throughout the young starter’s life while these three primary elements get themselves established in a kind of symbiotic relationship - a kind of dynamic partnership if you like. Pineapple juice has the correct ph, or acidity, to assist the fermentation process. Fermentation is stronger and more thorough when the enzyme mix is just right. Pineapple juice helps with both of these things. Getting the process going quickly supports helpful bacteria in sourdough culture. The more helpful bacteria there are, the less harmful bacteria there will be also. The process of fermentation involves a kind of relay race of bacteriological and yeasting activity. Pineapple juice keeps things ticking over while this natural process happens, and stops it from getting sidetracked. Once fermentation has been established, the ph in the starter does not require pineapple juice. Water is fine to use. Wholegrain flours contain more natural yeasts. Whether you use wheat, rye, spelt, khorosan or another type of grain, the flour should be truly wholegrain. Stone or hammer milling is best, as these forms of milling do not separate the various parts of the grain from each other. True whole grain flour contains all the bran, all the pollard, and all the starch to maintain these rapid processes going on in the starter during this early phase of its life. Once fermentation has been established, white flours can be used. Grains can also be changed from one to another, or new types cultivated from other grains. Many people, myself included, create their own flour mix which works best in their starter. How do I use and maintain the sourdough starter? You will have built about 300g of liquid sourdough starter if you have followed the recipe above. Most of the recipes using liquid starter in the site need 300g of liquid starter. Use half of the starter in your recipe of choice, and feed to replenish - which means 150 grams of flour to 150 mls of water. Feeding should be done at the same time as you make the dough for your next batch of bread. You will need to feed the starter approximately once a week. If you are making bread less often, then pour off half and feed anyway. Liquid starter can easily ferment too much, making it more alcoholic. In this state it won't make good bread. If you are interested in learning about sourdough culture, and want to attend workshops, buy sourdough starter or discover more writing from Warwick Quinton, follow this link to the School of Sourdough. To purchase my own starter, follow the link below. It will be freighted to anywhere in Australia for free.